Please welcome Melodie Winawer to The Qwillery as part of the 2017 Debut Author Challenge Interviews. 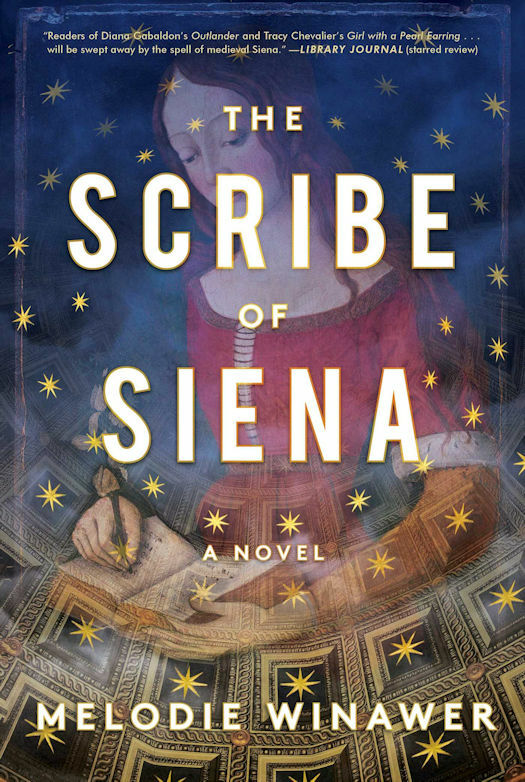 The Scribe of Siena is published on May 16th by Touchstone. Melodie: I’ve written all my life—since I was a kid. I wrote then for the same reason I write now—because I love to. Melodie: Full disclosure: I had to look up the word pantser! I’d say… I fly blind much more than I structure everything out before writing. I have some structure, but it isn’t until I sit down and actually write that the story emerges. Melodie: I don’t have enough time. 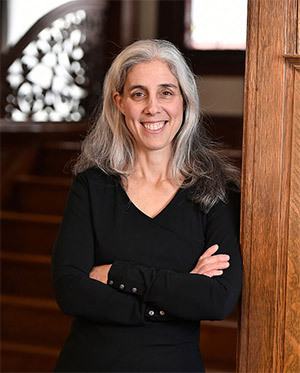 In addition to being a novelist, I have a beyond-full-time job (I’m a neurologist, neuroscientist, and run neuroscience courses at Columbia University’s College of Physicians and Surgeons), have three kids, and I commute three hours a day. Actually, the commute helps, since I write (if I can get a seat!) when I’m on the subway…in fact, I wrote much of The Scribe of Siena on my endless commute between deep Brooklyn and northern Manhattan (Columbia University Medical Center) where I work. Melodie: Everything! What my mother’s first boss once said to her 50 years ago. The look of the sky when I’m walking home from the subway on a windy fall day. The way I tear up when I hear my youngest daughter singing in the morning--everything. TQ: Describe The Scribe of Siena in 140 characters or less. Melodie: Time-travelling surgeon Beatrice takes on her late brother’s discovery of an anti-Siena conspiracy, while falling for a 14th century painter and medieval life. TQ: Tell us something about The Scribe of Siena that is not found in the book description. Melodie: It’s a meditation on the choice between two parallel lives, two ways of being, two possible selves. We all have moments when we realize another life is right next to us, an alternative path that for a moment is close enough to step right onto, just a little jump sideways and there--you’re on a new road. That common experience--a tough, poignant, powerful common experience --is at the heart of this book. TQ: What inspired you to write The Scribe of Siena? What appeals to you about writing historical fiction? Why did you primarily set your novel in Siena? Melodie: I’m a neuroscientist and neurologist as well as a novelist. When I find an unanswered question in science, I create a research project to answer it systematically, carefully adhering to facts. When I find an unanswered question in fiction—I get to make up the answer! I learned that Siena had fared particularly badly in the great Plague of the 1340s—worse than many Tuscan cities, including Florence, Siena’s medieval arch-enemy. And a single clear answer didn’t exist to explain Siena’s decline during and after the Plague, a decline that eventually led to Siena’s loss of independence and subservience to Florentine rule under the Medici regime decades later. That unanswered question became the historical focus of the story. Since I’m a doctor, I was also inspired by my firsthand experience of a physician’s empathy— experiencing a patient’s fear of illness, anguish, and in the best situations, relief. I know empathy can be a power for healing, but my work tests the boundaries between myself and those whose suffering I experience. I need to keep enough distance to do my job well, without losing myself in the process. I wondered how far it could go--that ability to feel what someone else is feeling. Could it extend to the written word, or even to words written hundreds of years ago? Could it, for example, blur the boundaries not only between self and other, but between two times? My experience of a physician’s empathy, and its dangers, led me to create my protagonist Beatrice. For Beatrice, a neurosurgeon who enjoys the great privilege of working inside patients’ brains with her hands, empathy—and its consequences—come unbidden, and unravel her orderly life. I set the book in Siena because it is simultaneously modern and medieval, a city where the past and present coexist. So it became the perfect place for me to set this story of a woman who, at first against her will, and then by desire, loses her place in time. I write historical fiction because I like to recreate the past in such a vivid and intimate way that I (and my readers!) can not only imagine, but walk right into it, as if it existed right now, with the door always open, next to our modern world. The book itself becomes a vehicle for time travel. TQ: What sort of research did you do for The Scribe of Siena? Melodie: I visited Siena twice: once before writing, and once after I’d written the whole manuscsript. I talked to two experts—Jane Tylus at NYU and Neslihan Senocak at Columbia University. Experts on medieval Italy are few and far between, and wildly enthusiastic when they find people with common interests; Jane and Nesli certainly were, and were generous with their advice. I read. I read more. I wrote down pages of questions. I asked my experts again, they answered, they recommended sources. I read those. I read articles, textbooks, museum guides, history monographs, guide books, maps. Anthropology, sociology, history. I read trial records, letters, books about 14th century merchants from Padova. I read historic cookbooks. I stared at paintings for details, and read descriptions of paintings to learn more. I tried to fill my head with the sounds and smells and sights of the time, then, when I’d read, I put my notes down to write. If I’d tried to learn everything I needed to know before starting to write, the book probably still wouldn’t be written now. As soon as I knew enough to put something on paper, I’d start writing again. If I found, as I did more research, that I’d made a mistake, I went back and fixed it. If I was missing a key piece of information—did a medieval child drink milk?—I’d look it up. Because my characters aren’t real people (or at least I think they aren’t—sometimes I’m not sure! ), I had the liberty to invent their lives. But I used the structure of real historical events, and sources on medieval Italian life, to make a home for them. 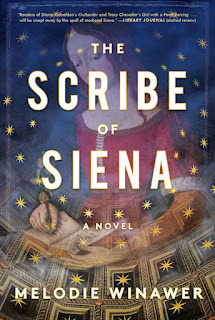 TQ: Please tell us about The Scribe of Siena's cover. TQ: In The Scribe of Siena who was the easiest character to write and why? The hardest and why? Melodie: Oh Beatrice was easiest, because, er…well…she was the most like me, in more ways than one. I’ll just leave it at that. Hardest…Iacopo. I had a lot of trouble figuring out the balance of good and bad in him. How sympathetic to make his story, how to fill out the complexity of his character. At first he was really one-sided, whiny, pitiful and annoying—even to me. He is supposed to be, to some extent, but that’s a balance too. Maybe he still annoys some readers, but I hope less so! TQ: Why have you chosen to include or not chosen to include social issues in The Scribe of Siena? Melodie: I did, but in an underhanded sort of way, not a hit-you-over-the-head sort of way. I think it is inevitable, and desirable, for a story where a modern protagonist finds herself in the past, to include some reflection on the nature of modern life, and the differences and similarities between modern and medieval existence. Any historical fiction does that, more or less explicitly, by virtue of the genre itself. Some of those “issues” included capital punishment, the fairness of legal proceedings, stereotypes about the past and other things we don’t know well, and whether those stereotypes are true, how we are inevitably biased by our assumptions. Historical fiction, at its best, can help shrink differences and foster connections not only across the centuries, but also across the modern walls that divide us. TQ: Which question about The Scribe of Siena do you wish someone would ask? Ask it and answer it! Melodie: The Scribe of Siena is full of fantastic medieval food descriptions. Where did you get the recipes? Have you cooked the dishes in your book? The recipes come from The Medieval Kitchen: Recipes from France and Italy by Françoise Sabban, Odile Redon, and Silvano Serventi, and many of those historically accurate recipes found their way into my book. I’ve made almost all of them, plus plenty of others I didn’t write about. Poratta bianca, a leek soup dusted with cardamom and nutmeg, is the first dish that welcomes my protagonist to medieval life. I’ve made pumpkin and farmer cheese tart in a flaky pate brisée crust, and an incredibly unusual lasagne fermentatam, springy hand rolled strips or squares of fresh pasta made from a yeasted dough layered with parmesan, cinnamon, long pepper, cloves, and ginger. I learned the recipes well enough to make their flavors and execution convincing in the pages I was writing. But more than that, cooking and eating medieval Italian cuisine gave me a connection to the past--an emotional, visceral connection that transcended what I read and went straight to the heart, soul, and belly of the era I not only tried to portray in writing, but actually longed to inhabit. Just like Beatrice. TQ: Give us one or two of your favorite non-spoilery quotes from The Scribe of Siena. Melodie: I’m working on a novel set in late Byzantine Greece. It centers in the now-abandoned city of Mystras, in the southern Peloponnese. The city is mostly in ruins, but many buildings are still standing. I have walked through its streets, into the churches and crumbling houses, and it’s even more magical than it sounds. It has a mysterious, tumultuous history as the center of the late Byzantine Empire after the fall of Constantinople, with moments of great triumph and also great despair. The new book, like the Scribe of Siena, connects the past and the present too, but I won’t give away how! The Scribe of Siena is the story of Beatrice Trovato, an empathic and brilliant neurosurgeon living in New York City. Her brother Ben is a historian who has moved to Siena to research its medieval past. When Ben suddenly passes away a devastated Beatrice heads to Siena for a much needed break from her work and to settle his affairs. Ben had been doing research on why the plague in the 14th century hit Siena much worse than other cities in Tuscany. Beatrice decides to continue Ben's research while holding off other historians who want his work and are trying to make things difficult for her. Because of this research and in particular a journal she finds written by the artist Gabriele Accorsi, Beatrice travels in time to medieval Siena. The Scribe of Siena is a gorgeous novel. Beatrice is a strong assured woman thrown into remarkable circumstances who manages not only to survive but start to make a life in the past. It does not hurt that she is highly educated. She has the skills to cope with what has happened to her. But it is not all smooth sailing for her in this unfamiliar time and she worries about how to get back to the present before the Plague comes to Siena. She knows the history, knows when it will hit and how it will come to the shores of Italy. She is absolutely helpless to do anything about it. On top of all of this there is a huge mystery to solve. Beatrice is trying to figure out why the Plague hit Siena much harder than elsewhere. She must uncover, if possible, the plotting by those who would control Siena. Winawer surrounds Beatrice with caring friends both in the present and also in medieval Siena. In medieval Siena she begins to make a life and finds employment. She meets Gabriele Accorsi and his family and falls in love with him while she becomes part of the fabric of her new home. Winawer's historical research is exceptional. The Scribe of Siena brings you the sights, sounds, flavors, and colors of Siena (modern and medieval) and you feel as if you are there with Beatrice. The novel has a lovely cadence punctuated by quite a bit of action. The story of Beatrice and Gabriele is heartwarming and deeply moving. Winawer has written a lush and spellbinding historical time-travel novel with an intriguing mystery, wonderful characters, and a stirring love story. The Scribe of Siena is a fabulous debut.